I do like Skottie Young as a writer, this should be fun to see him on writing chores but not also on art. 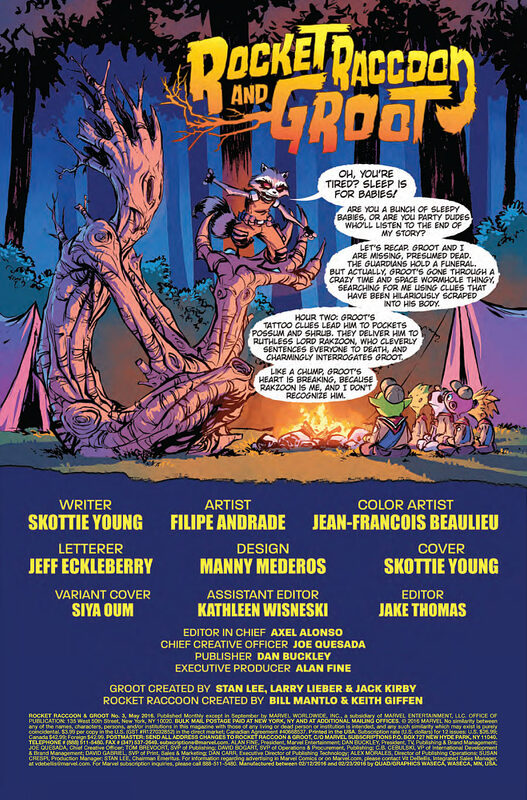 Fun way to do a recap page, with Rocket explaining the story as a campfire tale. Earlier in the series Rocket and Groot are presumed dead, the Guardians put on a funeral. Kitty was there, so I now have to track down the first issue of this series. Hopefully Hastings owns several of those, as it is the first issue, I’ll find out on Saturday. In reality, they’re back in time and in space. I guess they were always in space – but are we all not in space? Last issue, Groot is on an alien planet and becomes the prisoner of Lord Rakzoon, who is Rocket – but without the memory of Groot. This wouldn’t be so bad, but Rakzoon doesn’t recognize Groot, and his favorite thing to do is sentence folks to death. The guards are making fun of Groot. Groot says his name, like he always do, but it doesn’t phase Lord Rakzoon. 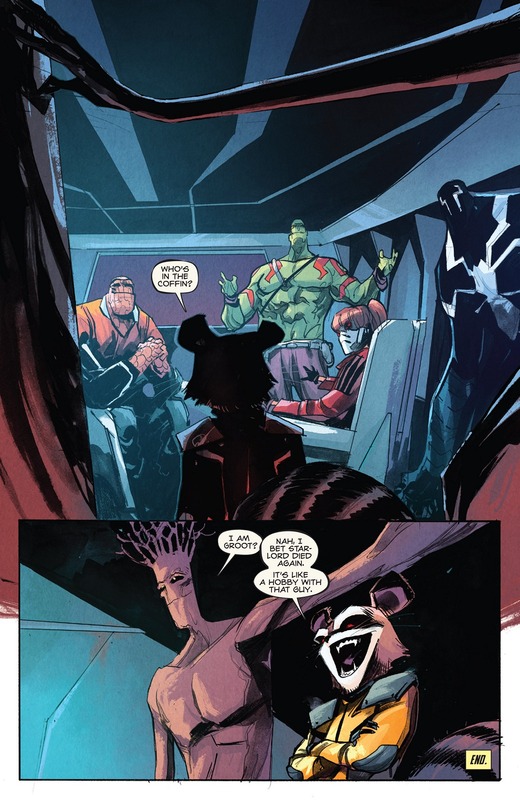 Rakzoon does recognize Groot’s language. 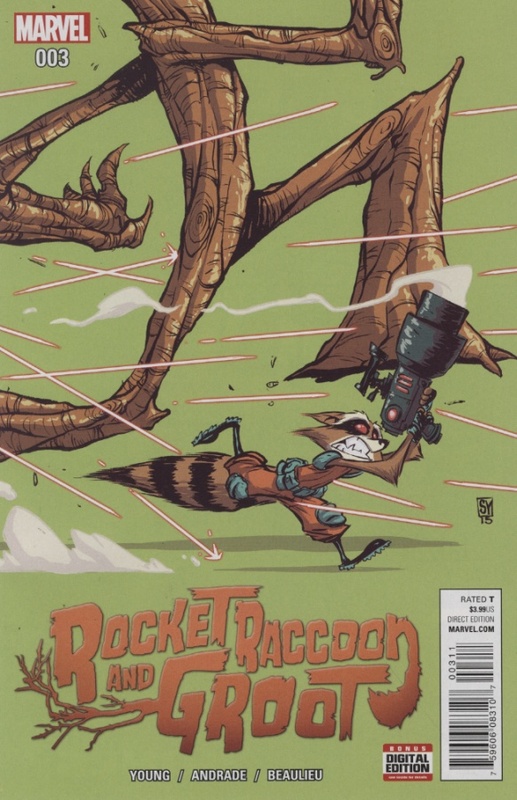 Rocket goes into what happened, I guess this series spins out of Rocket Raccoon 5 – thanks Jake T, the editor. I also guess that Rocket recognizes Groot now. Rocket ousted the old dictator, by tricking the inhabitants that Rocket was worst than the last guy. While explaining all of this to Groot, the guards don’t take kindly to be tricked. Rocket and Groot make short work of the guards. Rocket always has a plan. After the guards are dealt with, the previous dictator arrives – as Rocket clearly didn’t murder the guy. He has a mouse companion and a fuzzy green guy. The previous guy’s name is Nasoj. The shrub fellow can only say “me are shrub.” The mouse’s name is Pockets. We get the face off of Pockets v Rocket and Shrub v Groot. Pocket, is a possum, it turns out. Nasoj tells the guards to kill all four of them, which Pocket didn’t see that coming. Oh I get it, Possum + Rocket = Pocket. Pretty clever, Young! Pocket is also known for having a plan. The four start running away. Eventually. They locate Pocket and Shrub’s ship. Pocket doesn’t want our heroes to come with them but after a fight, Rocket takes their ship and flees. Pocket swears revenge! Shortly after Rocket left Groot on the Desert Planet. 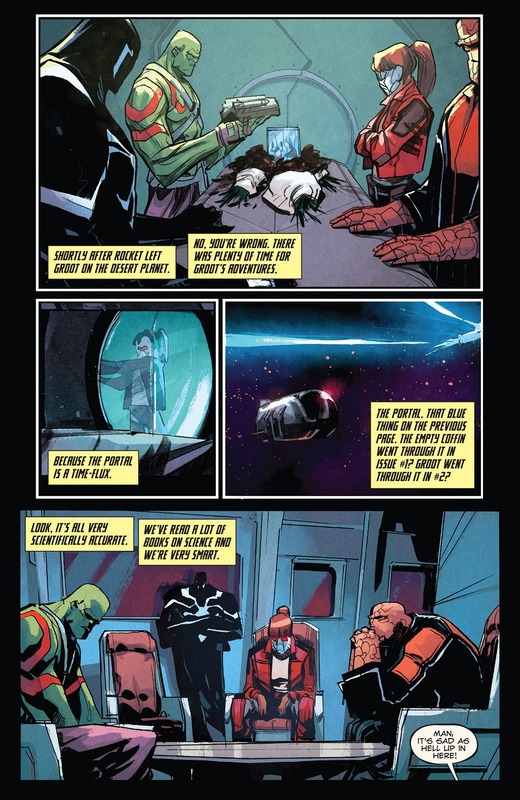 I guess enough time has passed that the Guardians (including Star Lord Kitty Pryde) put on a funeral for Groot. In comics, I just assume that a full year has to pass before one suspects a person to be dead. That’s just me, people fall into pocket dimensions all of the time. Those yellow captions are pretty funny! Issue ends with the team being reunited. Rocket suspects that Quill is in the coffin. Letters page has letters from – Chuck Lindsey / Andrew J. Shaw / Nathanael Gardiner and Hugh McPeek of Quaker City, Ohio.